Eyelet Cotton Fabric is a fantastic, unusual and classic fabric with embroidered "eyes" or cutouts reinforced uniformly to create a pattern. and is perfect for creating gorgeous blouses, dresses, heirloom sewing, and children’s clothing. Many times a material can feature both embroidery and eyelets creating a visual treat for all to see. Dye-able White Eyelet Fabric, Embroidered Cotton Fabric, it has embroidered floral eyelet design all over the fabric. 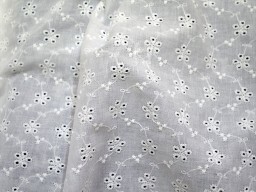 Hi..
Dye-able White Eyelet Fabric, Embroidered Cotton Fabric, it has embroidered floral eyelet design on both side selvage al..
Dye-able White Eyelet Fabric, Embroidered Cotton Fabric, it has embroidered floral eyelet design on one side selvage all.. Extra Wide Ivory Eyelet Embroidered Cotton Fabric, it has embroidered floral eyelet design all over the fabric. High qua..
Natural Cream Eyelet Embroidered Cotton Fabric. This can be dyed into any color. High quality fabrics for making skirt, ..
Navy Blue Eyelet Fabric, Embroidered Cotton Fabric, it has embroidered floral eyelet design all over the fabric. High qu.. Midnight Blue Eyelet Fabric, Embroidered Cotton Fabric, it has embroidered floral eyelet design all over the fabric. Hig..
Orange Eyelet Fabric, Embroidered Cotton Fabric with Border along one selvage and it also has floral embroidery all over..
White Eyelet Fabric, Embroidered Cotton Fabric, it has embroidered floral eyelet design all over the fabric. High qualit..
Yellow Eyelet Embroidered Cotton Fabric with Border along one selvage and it also has floral embroidery all over the fab..